Shriram Transport Finance Company has come up with it’s fourth public issue of “Secured Non Convertible Debentures”. Before proceeding further about it’s features and review, let us look at meaning of debentures and it’s types. Debenture-In simple term, when any company intends to raise loan from public then they may have the option to come up with debentures. 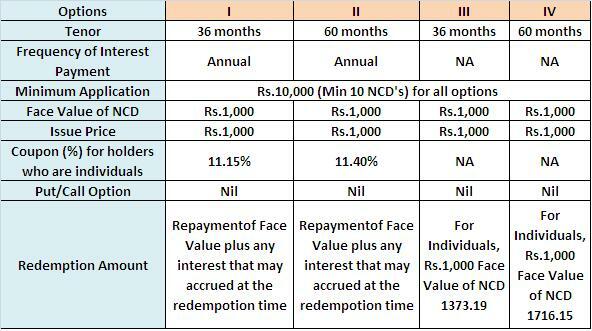 So if you are purchasing debentures of Rs.1,00,000 means you are giving loan to that company and in return company promises you to pay interest on agreed time, interval, and rate and also after maturity return of principal. 1) Secured Debentures-Such type of debentures are backed by company assets. In case of default by company, by liquidating the asset you can collect the principal and due interest payment. 2) Unsecured Debentures-These are the debentures which are not backed by any assets. Hence risk involved is more compare to Secured Debentures. So obviously Unsecured Debentures offer higher interest rate than Secured Debentures. 1) Convertible Debentures- These are the debentures which after expiry period have option to convert them into company’s equity. 2) Non-Convertible Debentures-These are the debentures which can’t be converted into company’s equity. Shriram Transport Finance Company is issuing “Secured Non Convertible Debentures” which will be available for subscription from 26th July 2012 to 10th August 2012. Few basic features are as below. 1) Credit Rating-By CRISIL AA and by CARE AA+ means stable. This is the current rating. It does not mean that same rating will hold for this company for the whole period. Credit rating agencies have option to review on regular intervals and change the ratings too. 2) Liquidity or Exit option before maturity-Through secondary market NSE and BSE. 3) For retail investors Demat is not mandatory. 4) No Put/Call option-Means you cant sell back to company during the period also company will not buy back during period. Now the big issue, can we invest in such debentures or not?? Safety-Eventhough this NCD is secured but you can’t expect the same security what Bank offers you. But compare to unsecured NCDs this instrument is safer. If you are ready to take little risk for the sake of earning 1% to 2% more than Bank FDs then you can go. So if you consider return then this NCD holds good compare to Bank FDs. Also reasons of coming with NCD rather than Company Deposit is RBI barred NBFCs to issue Company Deposit. As I pointed above, eventhough current rating for this company is stable, but you cant expect the same rating for future too. Interest Rate Risk-Liquidity is easy for you to sell this instrument in NSE or BSE but if you decide to sell during the period when interest rates are higher than this product, then you may not get the good return by selling. But if you decide to sell the instrument when the interest rates are lower than this NCD, then you may get a good return on this. So liquidity of this NCD is attached with Interest Rate Risk. Taxation:-If you held till maturity and interest earned on such instruments is added to your income and treated at the prevailing tax rate for you. So eventhough you are getting returns of around 11.15% and 11.40% but post tax returns are 7.80% and 7.98% (If you are in highest tax bracket of 30%). Only difference with Bank FDs and NCDs about taxation is-in FDs tax will deduct at source but in NCDs it is not the case. If you sold NCDs in stock market for liquidation purpose within one year then Short Term Capital Gain (STCG) will apply. So you need to pay on the gain as per your tax slab. If you sold NCDs in stock market for liquidation but after one year then Long Term Capital Gain (LTCG) will apply. In this case you need to pay tax of 10% without indexation or 20% with indexation.